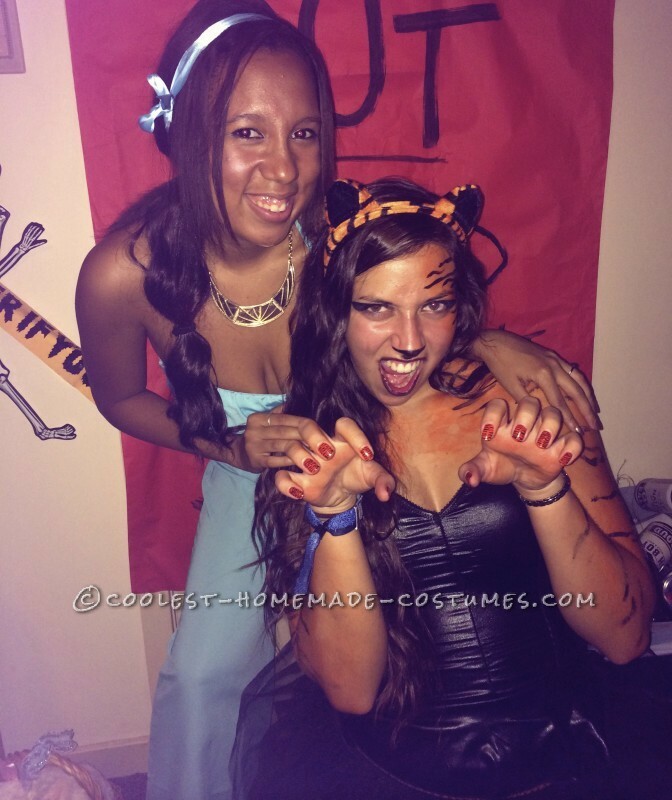 As Disney girls through and through we knew that we’d have to do a Disney themed costume at some point. 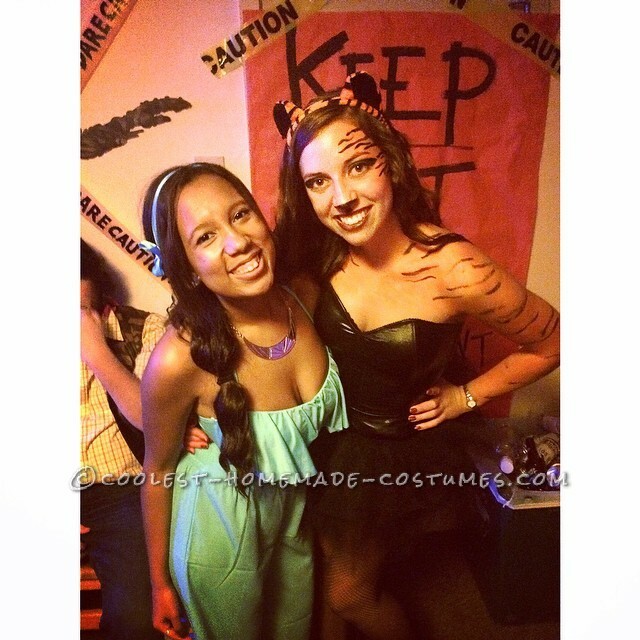 Being that our favorite movie is Aladdin, my actual name is Jazmin and Julie’s favorite animal is a tiger, we knew an Aladdin Halloween costume would be perfect! When we first came up with this idea, we knew we’d need an Aladdin. Seeing that my boyfriend Austin is tall, skinny and quite the trickster, we knew he’d be the perfect street rat. 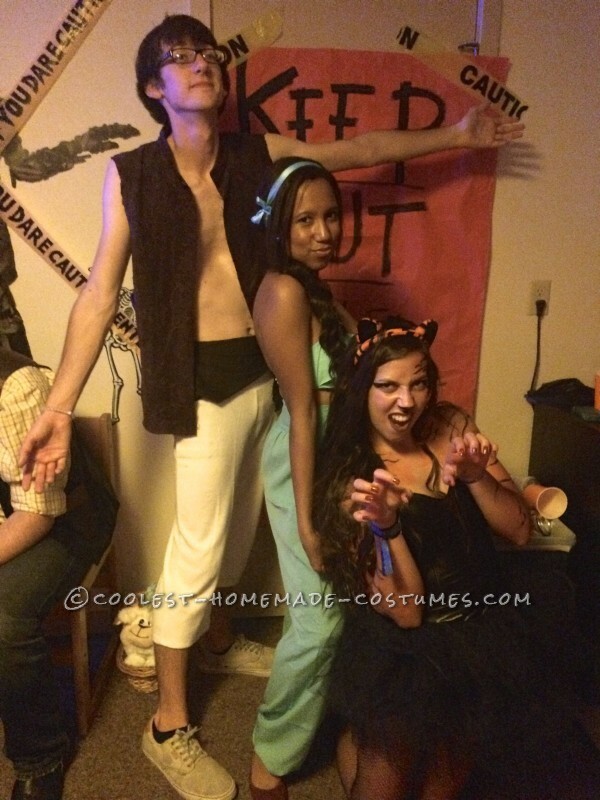 The biggest concern for Princess Jasmine’s costume was finding parts that matched. After many hours of searching I stumbled upon the perfect pair of baby blue harem pants at Charlotte Russe. Once I found the perfect pants I knew I needed a more perfect top. Interestingly enough, I couldn’t find a top that worked until I shopped the swimsuit section of H&M. Although both parts were ordered online they magically matched perfectly! My hair is short and I knew I needed to get some luscious locks so it was off to the wig store. I found clip in extensions that matched my hair color exactly and just happened to be on sale. With the addition of a blue ribbon and some princess-looking gold accessories, my costume was complete. With a pair of tiger ears and tail already in our possession, we were happy that the work on the Raja costume was already underway. Since Raja is such a fierce and sassy character, Julie wanted her costume to reflect just that. After trying on about 10 corsets at the Spirit of Halloween store, we found one that fit just right (which of course meant that it was really really tight). A tutu (found at a consignment shop for $6) was added for a girly touch along with fishnets and black booties for some edgy flair. You’d think finding orange paint at Halloween time would be easy, but you’d be wrong. Julie eventually found some at Party City and cleared the entire shelf. Knowing that the body paint would make or break the costume, there was a lot of pressure to make sure it turned out well. Thankfully Jazmin could use her art school skills to finish out the look. These skills were used to create the perfect smokey cat eye along with authentic tiger print nails. 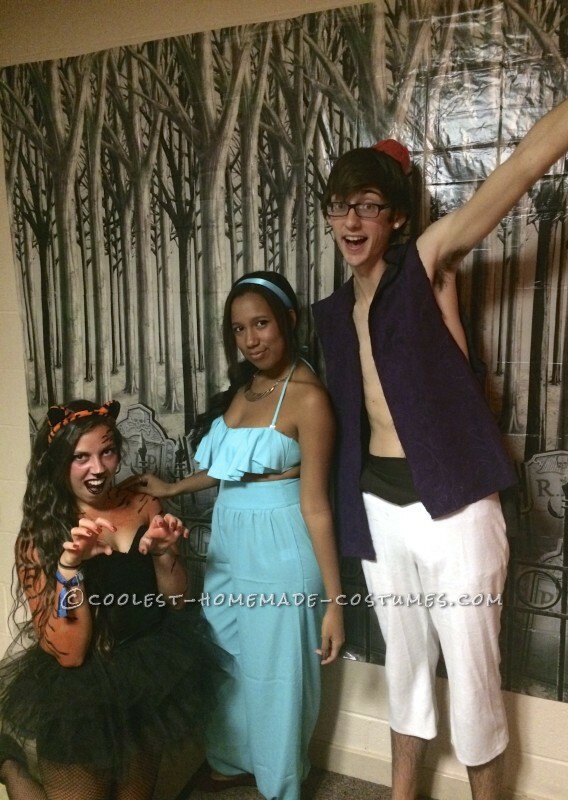 Much like the real Aladdin, Austin needed a little bit of help to get his life together. After finding a pair of white mom workout pants at the thrift store and a vest made out of what we can only describe as an old purple velvet woman’s top from the 20s, the main pieces to his costume were solidified. His brown sash was craftily constructed from Julie’s retired brown leggings. Austin ended up pulling some of his weight by making his hat out of felt and construction paper. I guess street rats aren’t completely useless. 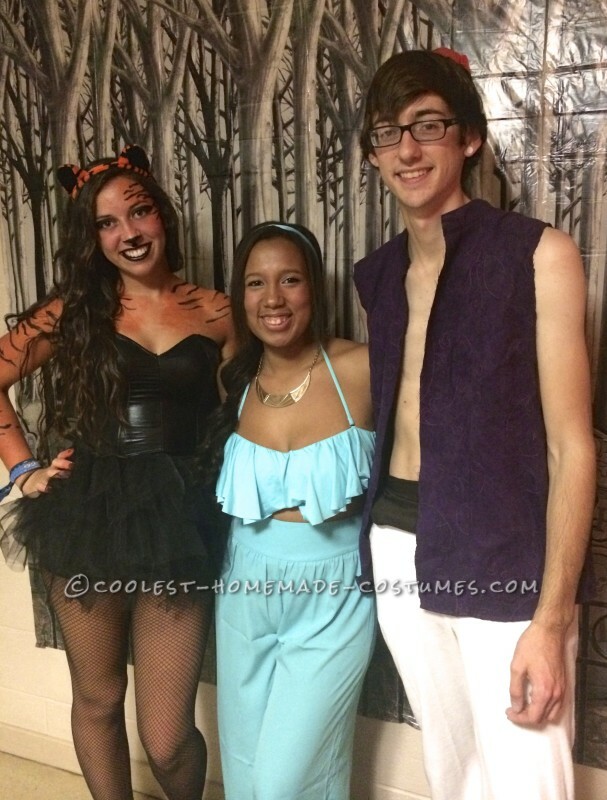 The costume was a hit and we got an overwhelming amount of compliments at our Halloween party. When we first hatched the idea, we didn’t know it would be executed so well! With a little bit of hard work, perseverance and creativity, we were able to put together a group costume we will never forget.